KoopaTV: Not Just FAKE NEWS, But Now Nintendo CENSORS Apollo Justice: Ace Attorney! Not Just FAKE NEWS, But Now Nintendo CENSORS Apollo Justice: Ace Attorney! By LUDWIG VON KOOPA - I think someone at Nintendo doesn't understand that they're acting against their own interests. It is fairly common knowledge by now that Nintendo has made CAPCOM game Apollo Justice: Ace Attorney the target of a FAKE NEWS campaign. It's unclear to me why. Previously, I thought it was because Nintendo thought that making things up about Apollo Justice: Ace Attorney would help its Nintendo 3DS port — to be released next month — sell better. The game has a reputation of being a lesser-quality Ace Attorney game (...which still makes it a good game), so some false-founded fluff might fascinate folks on the fence? Left: Miiverse post made by RawkHawk2010, created due to a misinformed interpretation of an extremely important Apollo Justice: Ace Attorney event. Middle: Me informing Rawk of the correct Apollo Justice: Ace Attorney event. The comment was deleted by the Miiverse Administration. Right: Me raising an OBJECTION! to the Miiverse Administration. It was overruled. 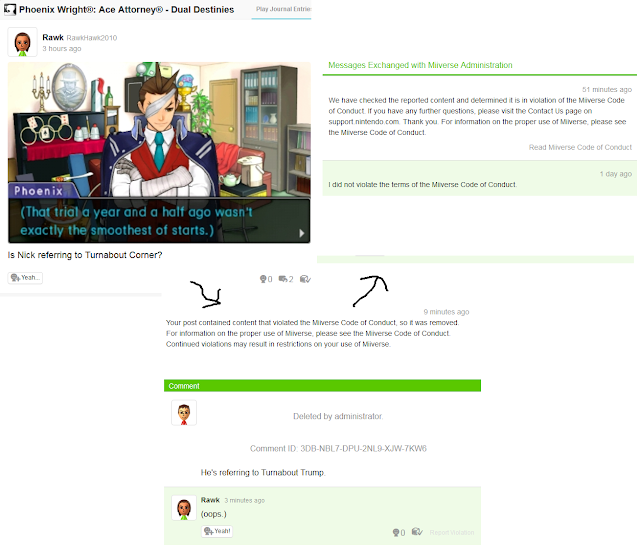 The administration on Miiverse said that directly referencing Turnabout Trump, the first case of Apollo Justice: Ace Attorney, was a violation of the Miiverse Code of Conduct. They gave no explanation as to why. I told them I made no such violation, and they determined that I did. What? Basically, in the game Phoenix Wright: Ace Attorney — Dual Destinies (the direct sequel to Apollo Justice: Ace Attorney), Phoenix Wright referenced that Apollo's first-ever trial of his career, known as Turnabout Trump, was a really rough way to start any lawyer's career. It was a much tougher first trial — in terms of case complexity, mental and emotional drain, and personal stakes — than Phoenix Wright's first case. 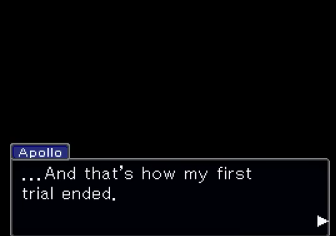 While Turnabout Corner was... a bad case, it wasn't the start of Apollo's career and it had no consequential impact to the series or story. It's important to correct the record that Turnabout Trump is the case that Phoenix Wright was talking about, since that case has direct implications for the story of Phoenix Wright: Ace Attorney — Dual Destinies. I won't go into spoilers, but basically, by trying to erase Turnabout Trump from history, the Miiverse Administration (read: Nintendo) is censoring critical Apollo Justice: Ace Attorney information that people need to know. It's particularly important for the game's sales, since Turnabout Trump is the best case in Apollo Justice: Ace Attorney. It's the only Ace Attorney game where the best case is at the beginning instead of the end. Without that first case, the game would go from good to... not good. I won't give you the details about Turnabout Trump. You'll have to play Apollo Justice: Ace Attorney yourself, even if Nintendo doesn't want you to. Does the Miiverse Administration realise that Nintendo financially benefits from selling games off the Nintendo eShop? CAPCOM said that Apollo Justice: Ace Attorney would be released on the Nintendo 3DS in November, but they didn't specify when. Assuming that it releases on a Thursday (when Nintendo eShop games release), that gives a 1-in-5 chance that Apollo Justice: Ace Attorney will release on the one Thursday in November that takes place before Miiverse closes. That is assuming that every Thursday is equally likely. If Apollo Justice: Ace Attorney does release on November 2nd, will it get a Miiverse community that will exist for a handful of days? And if it does, will the Miiverse Administration ban anyone who posts about the first trial of the game? ...Which would be basically anyone who buys the game and wants to post about it? Ludwig wasn't really planning on making a push for people to buy Apollo Justice: Ace Attorney on the 3DS, but if Nintendo is trying to cover up THE TRUTH, then it's a must-buy! What Ludwig DOES want to push is participation in the Ace Attorney guest posting initiative that KoopaTV is running. Read about the guest posting initiative here, or written in a different wording here. You have until the end of October 30 to submit your guest post! Do so, and do so well, and you can win the KoopaTV Loyalty Rewards Program Round 16 and earn a $10 Nintendo eShop card! Apollo Justice: Ace Attorney on 3DS will be releasing November 21 in North America, and November 23 in Europe. By the time of the game's release, it's Round 17 of the KoopaTV Loyalty Rewards Program and it's an even easier buy. I know it's an unpopular opinion, buy I didn't mind the ending to the game. Although it doesn't make much sense how the events unravel in both the past and present simultaneously, I thought it was an interesting concept nevertheless. I agree it's interesting, conceptually. But I can't just excuse the bad execution, now can I? I love Apollo Justice's fourth case. I just have to suspend my disbelief much more than usual to get past the time travel in a game with no time travel. Well, since I don't have to go out of my way to suspend my disbelief for Turnabout Trump, I enjoy that case the most out of the four in the game. Also because the characters involved are a lot more fun than 4-4's...depressing lot.